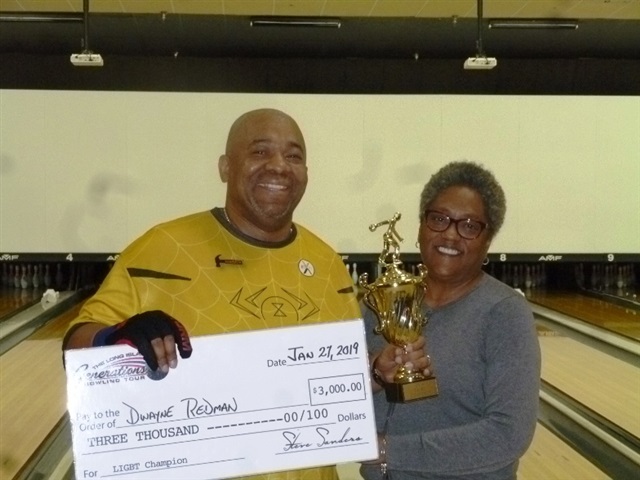 Garden City, NY: Dwayne Redman, a 56 year old payroll coordinator from the Bronx, won the $3,000 top prize at LIGBT’s Winter Major held at AMF Garden City. Dwayne earned his third LIGBT title (first major) by defeating Glenn Buchanan, New York City 230-226 in the final shootout. While Glenn earned $1,500 for second, finishing third was Frank Lunghi, Farmingdale, NY with a 219 worth $750. Rounding out the top 4 was Audrey Rodriques, Otisville, NY with a 214 worth $500. The final shootout was one of the most exciting in LIGBT history. The shootout began with 3 out of the 4 bowlers starting with at least 2 opens in their first 4 frames. Glenn was the only bowler that had just one open plus he had a double in his first 4 frames. By the 5th frame Dwayne had 3 missed spares and trailed Glen by 42 pins. But Dwayne is a fighter and he didn’t give up as he threw 4 strikes in a row heading into the 10th frame. When Dwayne failed to throw a strike in his final frame all Glenn needed was a mark. Unfortunately he chopped the 6-10 which gave Dwayne the victory when he made his spare. It was an incredible comeback for Dwayne and a very tough loss for Glenn who was looking for his first LIGBT title. The AMF Garden City event drew a great crowd of 270 entries (including 35 desperado entries), advanced 39 bowlers to the finals and paid out $13,570. The cut scores on the “Autobahn” pattern were moderate and ranged from 661 to 706. High series of the tournament was shot by Diane Allen, Fleetwood Station, NY with a 791 in the Sunday, 2pm squad. There were 2 wildcard winners. The Friday night wildcard was won by Jason Nicholas, Wantagh NY with a 1329 six game series and the Sunday wildcard was won by Jack Saunders, Holbrook, NY with a 1349. LIGBT’s next tournament is our annual Super Bowl Scratch and Handicap Marathon on Sunday, February 3rd - 1pm start at AMF Wantagh. Top prizes are guaranteed at $1,000-$500-$300-$250 with 1 in 5 per age division cashing for a minimum of $100. To view the final results of the AMF Garden City Winter Major please visit www.ligbtour.com. The LIGBT is sponsored by Kegel, Knockout Ball Cleaner, Torch Bowling, Vietri Associates and Billvee Electric.